A selection of the many peripherals that were available for the Spectrum. 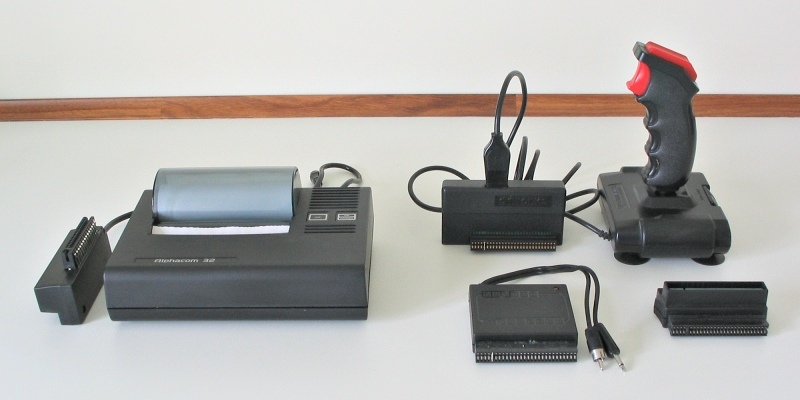 This thermal line printer was a third-party alternative to the official Sinclair ZX printer. It had the advantage of printing on white paper, unlike Sinclair's "silver bog-roll burner". Back right: A Spectravideo Quickshot II joystick, connected to a Kempston-compatible joystick interface made by DK'tronics. This little box generated a voice so robotic it would make Steven Hawking sound like Kelsey Grammar. Nevertheless, being able to make your Spectrum talk was huge fun. This little device doubled up the Spectrum's expansion slot, so you could plug in two peripherals at once. Assuming you could find two peripherals that actually played nicely together of course.